Llama Llama Holiday Drama by Anna Dewdney If your kid is a Llama Llama fan, then check out this holiday version of the book. In this story, Mama Llama is busy preparing for Christmas. Little Llama has nothing to do but wait. (Sound familiar?) This results in a little holidrama (aka. meltdown) for Llama llama. Mama is reminded to stop and remind Llama that they need to take time in their busy holiday to snuggle, hold each other close, and spend time with each other. I decided to take some time out from the holidrama to spend some time crafting with my littlest guy. He doesn't always get as much attention as his big brother did at this age (clearly, he doesn't even have all of his clothing on-- just pj bottoms). I wanted an easy project that a 22 month old could do with momma while his brother was distracted with video games. We made this dramatic Christmas tree. I gave Tyson 3 green lids. To avoid a holiday meltdown, I gave Tyson one lid at a time. We started with stickers. Then used glue and buttons. We finished up with the grand finale of glitter glue. I then glued his three decorated lids to green paper and we topped it off with a yellow "star" lid. You could always decorate the star as well, Tyson's attention was beginning to wane at this time. I added a trunk as well. Tyson was very proud of his finished art work, and I think he enjoyed his 1 on 1 crafting time with momma! This is Day #2 of the 12 Days of Christmas at Ready. Set. Read! and Reading Confetti. Yesterday Lori shared a great book about a family who had a Christmas tree that was too large to fit into the house-- and a Christmas tree craft that is perfect for preschoolers! In case you missed it, I had a Christmas Tree Puzzle that you can make yourself! Don't forget, you can find all of our crafts at the 12 Days of Christmas Pinterest board. How fun! 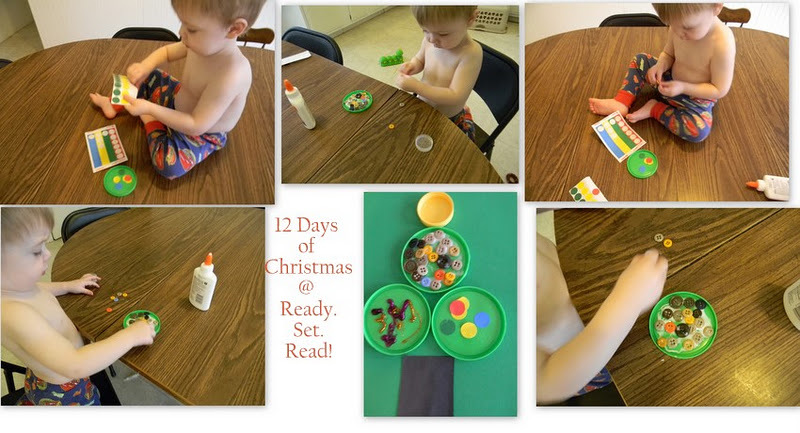 What a great way to get your little one into the holiday season through books and crafts. I know what you mean about trying to squeeze in special time with your younger children. They grow up so fast. Every minute is precious. I think it's funny you mentioned he only has his pj bottoms on. He looks very happy! That's all that matters at home. Enjoy your holidays! first - I LOVE that h is only half dressed makes me feel normal! somdays my littlest never gets out of his pjs...secondly I love this idea! I run a daycare so am always looking for ideas for kids of ALL ages and this is defintly one of them!! Such a fun little craft and an easy cleanup too. My favourite kind of craft! I also wanted to let you know that I chose your blog for the versatile blogger award. To grab it pop on over to my blog. It's such an achievable craft, yet looks really effective too! That is such a cute little tree! I too believe in getting little tots started on arts and crafts in their early days. Some people think the two-and-under crowd can't do art... but they're WRONG! I have heard great things about the Llama Llama books- must pick some up for my sons! Great craft too- might try something similar with my toddler. Such a great little no fuss craft! We ordered Llama Llama Holiday Drama from the book order--can't wait to get it now!